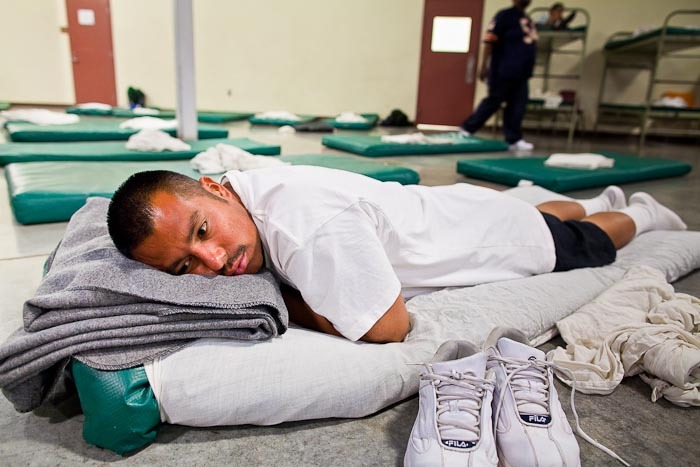 A homeless man lays on his mattress on the floor at Central Arizona Shelter Services (CASS) in Phoenix Wednesday. Phoenix was hit by a winter storm Wednesday that brought heavy rain and unusually cold temperatures, it is the first day of what is expected to be a week of below normal temperatures. Morning lows by Friday are expected to be 15-20 degrees blow normal, normal lows for Phoenix are in the 40's but by Friday are expected to be in the 20's. Weather like this hits the homeless especially hard and shelters like CASS work hard to meet the increased demand. A spokesman for CASS said they expected to fill all of their regular shelter spaces and most of their overflow spaces every night for the next week. In addition to the cold weather CASS has seen demand for the services increase sixfold in the last three years as the Phoenix economy has slid into recession and the foreclosure crisis cuts through the community like a scythe. Many CASS clients now are the "new" homeless - people who used to have homes but lost their homes in the bad economy. There are more photos from CASS in my archive and available from ZUMA Press.